If you are familiar with AR15 upgrades, Geissele is a name almost everyone knows and trusts for AR15 match grade triggers; from competitive sport shooters to our military’s finest. Geissele has become a household trigger name delivering some of the first true match grade triggers on the market and still today is considered the top 2-stage trigger available for AR15 shooters. 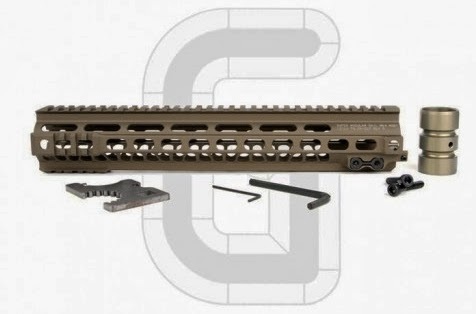 Now we are seeing the company expand into number of other products including Glock magazine funnels, Ar15 gas blocks, and several different AR15 handguard rail options which Geissele has named the SMR - Super Modular Rails. The concept behind the SMR was developed while the company was working with one of its larger customers on how to deliver a very stable free float rail system which would hold the zero of forward rail mounted lasers and sights. The current crop of rails on the market was not delivering a highly durable option that maintained zero in combat situations. 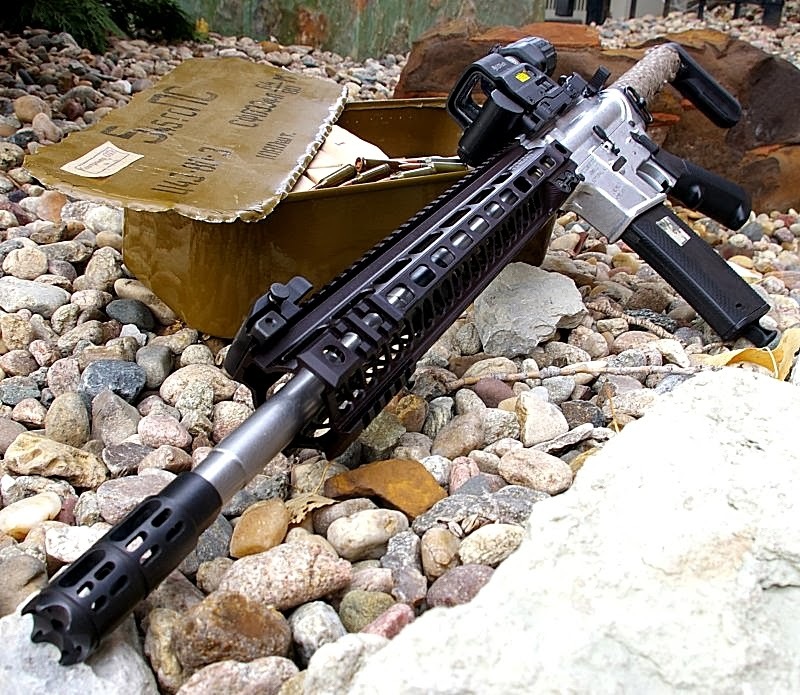 Geissele’s design was developed around the concept of a longer non-indexing barrel nut which could provide the handguard more support and rigidity. This concept was originally pioneered by Barnes Precision several years ago, however the long barrel nut design is becoming “the” attachment rail platform due to its many rigidity and durability advantages. Geissele went a step further and developed a set of high strength 3D machined trellised Super Modular Rails which can be configured for any mission or shooter need. Originally the heavier full featured MK1 version was developed and along the way the MK2, Mk3, and Super Ultralight M4 version, I am testing, were developed as variations on the original MK1 design. My preference is almost always to lean toward a lighter weight build where possible and I was excited to test out Geissele’s new 13" Super Modular MK4 Rail on a recent custom build centered around the 5.45x39 Russian Surplus AK74 round. What you see here was the original American Spirit Arms build featuring the Geissele forend before it received a new barrel and… well pretty much a complete rebuild. The challenges with an out of spec barrel forced the rebuild. The featured and tested build included an American Spirit Arms Naked (un-anodized) receiver set, a dubious Gunbroker 5.45x39 barrel, Model 1 Sales 5.45x39 bolt, YM Carrier, Eotech combo sight and 3X multiplier, Ace Ultra Light Stock and Houlding Precision Curse Muzzle Brake. 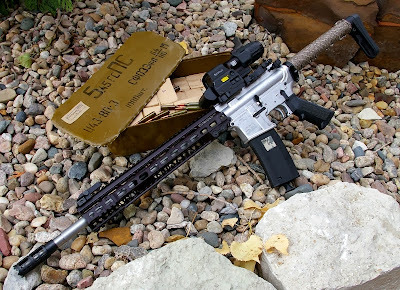 It Looks awesome, however due to the barrel specs, it tumbled bullets. Despite these issues the Geissele forend was given a harsh beating supporting over 3000 rounds of 5.45x39 Russian Surplus ammo tested through this original build. Suffice to say, I tested the heck out of this forend. Generally I am not a quadrail or ton of accessory rails kind of guy. I was at one point, however I saw the light.. as in light weight and have never looked back since. What appealed to me on the Geissele MK4 rail was that it was a very light 12.7 oz but provided all the minimalist rails I would ever need integrated into a rugged light and airy design. This is a premium grade 3D milled rail/forend/handguard far from what we see many companies offer. Some offer little more than a round tube with slots, others have a custom extrusion, but just punch a bunch of holes in it. In most cases you normally get a handguard with a bunch of sharp little edges that has the effect of a cheese grater on your bare hand which can and has cut my hand. On the custom billet machined Geissele MK4 every bare hand accessible hole in the forend/rail is perfectly radiused to provide a soft cut free grip. Troy was one of the first companies to deliver these top notch details on a handguard, however Geissele’s has taken it to a whole different level of detail with what they are doing in the 3D machining realm. There are contours on this rail that simply do not exist on any other rail on the market. All this adds up to more strength with less weight. The finish is perfectly anodized Type 3 Hardcoat for both the black and Desert Dirt colors. Geissele notes that there will be variances in the Desert Dirt finish color due to the natural variances in the anodizing hard coat process. The only way to guarantee a specific shade is to use Ceracoating which affects the tolerances of the rail. Geissele choose to stick with hard coating to maintain specifications and provide a higher level of finish durability than Ceracoat. Integrated features are front and rear QD-sling mounts on each side of the rail which provide 45-degree QD-sling position locking. 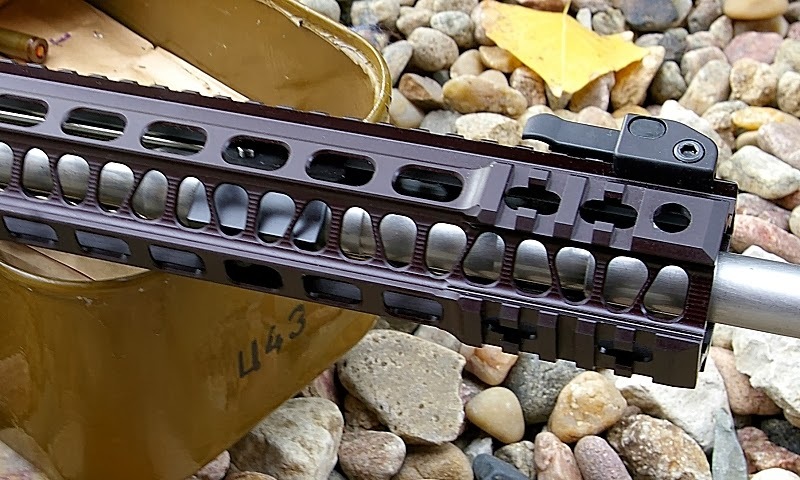 Short left, right, and lower integrated Picatinny rails provide all the accessory mount capability we mortals require in addition to the full top rail. The forend is mounted by removing the existing stock barrel nut with the supplied wrench, and remounting the barrel with the non-indexing Geissele GA-Barrel nut which allows the barrel nut to be perfectly torqued to manufacturers specs. Generally you have to just compromise the barrel nut torque to align to the gas tube, however the Geissele design allows perfect barrel torque which delivers optimal accuracy from your barrel. Once the extended barrel nut is mounted, the gas block/tube assembly can be remounted, and the MK4 forend can be slipped over the nut. Geissele has integrated a micro tuning/locking system via its 3D machining with set screws that lock onto the receiver for perfect alignment. Once aligned, the main two rail mount bolts can be tightened down without disturbing the alignment of the rail. Once everything is assembled and tightened down, the rail is much more solid than handguards that just mount to a stock barrel nut. The only potential negative is the MSRP $325 price tag which is a good $100 more than any other equivalent rail, but street prices will obviously be less. 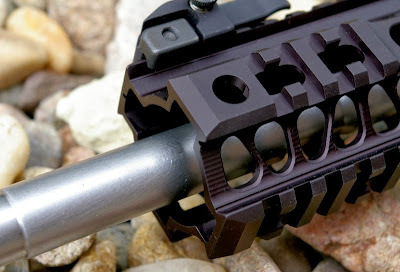 That noted, the extra 3D milling steps to radius every single little hole in the handguard adds extra milling time, so does the receiver adjustment set screw ears, and the reinforced barrel nut mounting around on the handguard, contouring and the extra lightening steps to drop the 13” rails weight to only 12.7oz. 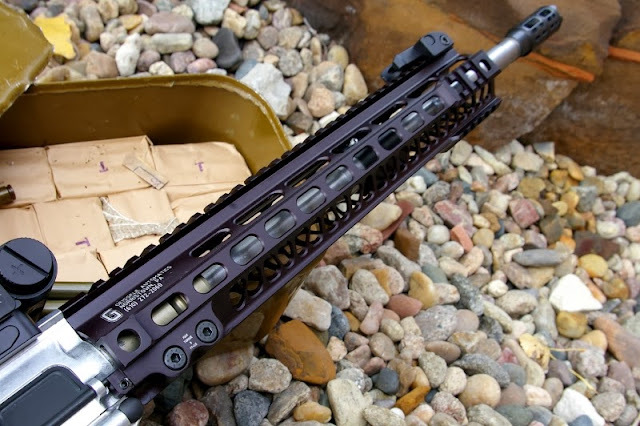 Keeping in mind an equivalent spec’ed and railed carbon fiber handguard would weigh in at about 10oz, so what Geissele has done is pretty amazing. There are a lot of rails out there, some have similar features, and maybe even a similar look, however Geissele has taken this rail to a whole new level with the finish and little touches that are designed to enhance the comfort of the shooter and deliver some extra custom detail in the process. If you want the most detailed and perfectly finished handguard/forend/rail on the market, I guess its funny that you need to look to a trigger manufacturer who has a legacy of perfection and precision. Enjoy your professional reviews and all the work that go into them. I am build a AR15 with a high end objective. I am looking at Sun Devil billet,San tan and Noveske billets. Could you please tell me your thoughts or another product that you like better. For hand guards, what I like and look for are long barrel nuts. Barnes created the first rail with a very long barrel nut which functions like a reinforcing receiver trunion. 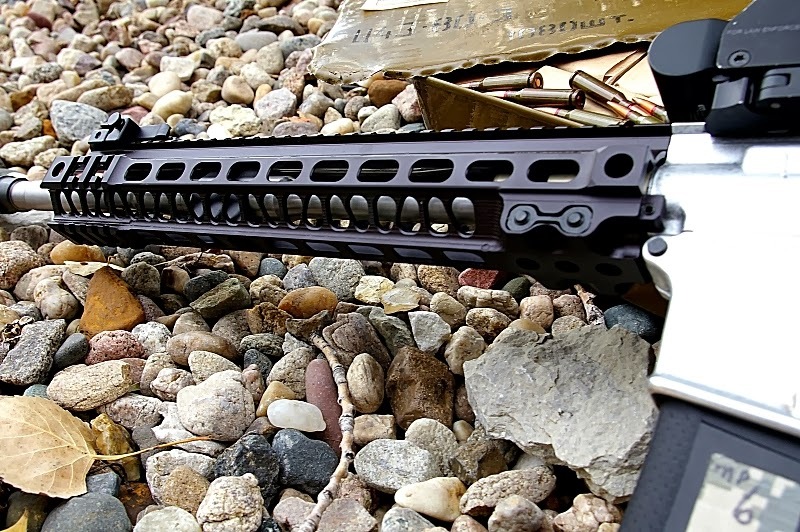 Now many companies like SLR, Geissele, and many other have copied the Barnes Handguard idea. JP Rifles has a different concept that delivers the same stiffness. I have the same exact rail and the same thoughts. I've been through a number of high quality rails (KAC, Troy, etc.) but none have been as rock solid as this MK4. And when considering strength to weight, forgetaboutit.